At Rennsport Reunion, an event full of every conceivable mind-blowing Porsche that you can think of, one car upstaged them all. It wasn’t an ex-Le Mans car, a shop build funded by an unlimited pocketbook, or even a Paris-Dakar racer. 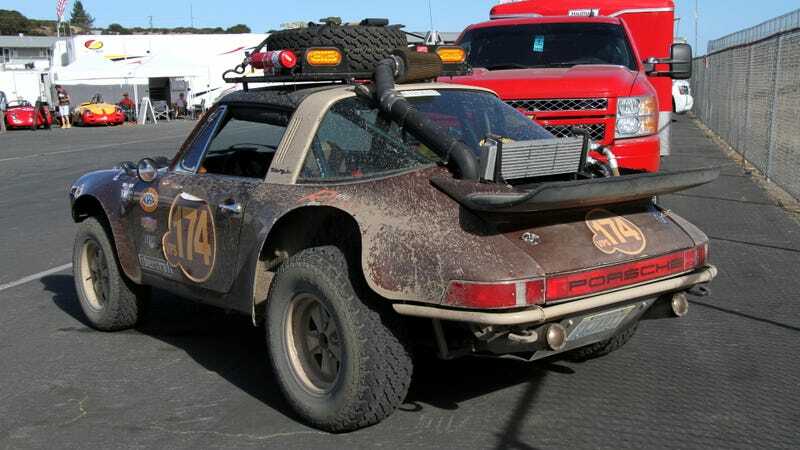 It was this rowdy, dirty, lifted 1974 911 Targa with the fenders sawzalled off that competes in off-road racing. It wasn’t even racing at Rennsport and it won the weekend. Rennsport Reunion gathered the best Porsches on earth out of the woodwork to come to Laguna Seca, many of which were there to race. It’s the ultimate up-close look at many legendary race cars and insane Porsche builds, new and old. That being said, none of those Instagram-perfect cars showed the true joy of Porsche hoonage off quite as well as this well-loved, mud-coated Targa. The 911 Targa’s owner, Ned Bacon, had dreamed of making a Baja-ized 911 after owning several VW-based off-roaders. When a particularly ugly Targa showed up on aircooled mega-forum The Samba, he jumped at it. It was the perfect car for such a build. A previous owner tried to make 911 Turbo widebody fenders out of bondo and sheet metal, and they turned out lumpy and weirdly proportioned. “It was just screaming for a sawzall,” Bacon told Jalopnik. Everything looks cooler with a light pod: fact. He picked up the car near Los Angeles in January 2010, and over the next couple years, his desire to Baja-out a 911 took shape. Originally, he just wanted a fun car that wasn’t too precious, and could also mount curbs if he wanted to for the laughs. For this, the car was perfect. The original 2.7-liter flat-six engine was strong, but it looked ugly. The Baja 911 in action. Then Bacon got the idea of running the Baja 911 in National Off-Road Racing Association events like the Mexican 1000. That’s when this build went truly off the deep end in terms of awesomeness. The suspension got beefed up for race duty with Fox shocks all around, which were revalved to off-road racing specs. The front Fox Shox 2.0 struts were modified with raised spindles and Weltmeister uniball upper strut mounts, and the rears are Fox Shox 2.5 reservoir shocks that give the car 10 inches of suspension travel. The car also got a set of Weltmeister adjustable spring plates. A roof rack for numerous “just in case” items. Bacon reinforced the chassis to take more abuse at all the front suspension mounting points, and also reinforced the front lower control arms and torsion bar housing. Custom bumpers and steel skid plates were added to further shield the breakable bits from Mother Nature’s rudest rocks. Massive 70-sidewall General Grabber AT2 tires proudly hoist the Targa body above the earth. The rear tires alone are about 31 inches tall. Safety items were added to get the car ready to race as well: a 22-gallon Fuel Safe fuel cell and a custom-built roof rack, among other requisite gear. The roll cage came from Safety Designs but Bacon added extra bracing to their design and tied it into the front and rear suspension of the car. Mastercraft Baja RS suspension seats—which are springier than your average ultra-thin road-racing seat—make the ride a little more comfortable through the dug-out chunks left by trophy trucks. A cozy cabin built for wherever you want to go. There is a surprising amount of stock Porsche parts in this build, though. The stock 911 steering rack was upgraded with 911 Turbo ends. Its massive tires are mounted on regular fifteen-inch 911 Fuchs wheels, which go over the stock 1974 911 brakes. The car also has Lobro CV joints meant for a Porsche 911 Turbo from the era. The torsion bar had to be adjusted for more ride height, but is also a stock 1974 911 part. Bacon also kept the stock aluminum “banana” trailing arms, which are stronger than the steel versions that came with some 911s. The car has raced hundreds of grueling miles in two NORRA races as of this writing, and has yet to break any suspension parts. The current incarnation of Bacon’s 911 Targa engine has all kinds of coolers and filters sticking up to keep it running well despite the barrage of sand it gets off-road. Mat Lowrance at Reno Rennsport rebuilt the car’s original 1974 915 manual transmission. The original 2.7 went into storage to add a Lowrance-built carbureted 2.8-liter engine (built up from a 2.4-liter aircooled that used to be in a Meyers Manx dune buggy) in the car before its first race. “It’s pretty amazing how much punishment stock 911 parts can take,” Bacon told Jalopnik. That’s the best explanation for why 81,550 Porsche nuts would descend upon one race track in California that I heard over the course of the entire event. It’s my favorite color scheme: brown on brown on more brown! The Bacon husband-and-wife duo raced the Baja 911 for the first time in 2013, setting off from Mexicali, but it didn’t fare so well. The car’s Zenith carburetors overheated and caught on fire after only about three-tenths of a mile after the starting line. Luckily, they extinguished the fire quickly, and most of the car was fine. The 911 Targa in its natural habitat. The Bacons race on their own, with no chase car or anything to help them out. It’s just Ned behind the wheel and his wife Kat as navigator. Luckily, some locals saw them stranded and went into town to pick up a set of Toyota air filters to Gorilla tape over the carburetors to keep sand out. After the melted plastic and metal were out of the engine and the carbs got rebuilt, they were back in business. The car went about 350 more race miles before the engine seized due to an oil line that was cut somewhere along the course. The 911 raced in NORRA again in 2014, on a revised race route that started in Ensenada. A new Reno Rennsport-built 3.2-liter engine went in with CIS fuel injection, thus removing sandy carbs as a point of failure. However, a small gap in the fuel injection system’s air box sucked in enough dirt to wreck the new engine somewhere around 450 miles into the race. The engine lost compression, and their race was done. Now the car is on its third engine, a stock CIS 3.0-liter flat-six from a 911SC, also built by Mat at Reno Rennsport. The Bacons returned to racing their Willys Jeep, and the 911 has settled into life as a fun play car—clearly still getting ample use as you can see from the dirt clods clinging to every surface of the car. Yet the idea of returning to race with the 911 is still there, tempting Ned. A later team finally finished a NORRA race with a Baja-ized 911, albeit with a much bigger budget. Still, it’s proof that a 911 can do it, and Ned keeps wondering if his 911—all built at home save for the engine and transmission—could, too. He’s already planning a Baja fun run with some friends that would take the 911 from San Felipe to La Paz. At Rennsport Reunion, Bacon’s 911 still wore the evidence of its fun detours off the pavement, yet it was still able to make the 300-mile drive from Nevada to Laguna Seca with no issue. Porsche fans often say that they love having a car that can pull double-duty, both as the fun car and as a practical, usable road car. This ain’t-care 911 Targa takes that idea and turns it up to 11, making it the obvious best-in-show at Rennsport. You can read more about the Bacons’ off-road adventures at their website here. Inside, it’s a pretty normal 911.